My relationship with KLR has granted me the privilege to work on a number of projects for, or related to, that organization. These have included the main KLR website, as well as sites for KLR Search Group and KLR Wealth Management. It is this final site that is the subject of this entry in my portfolio. 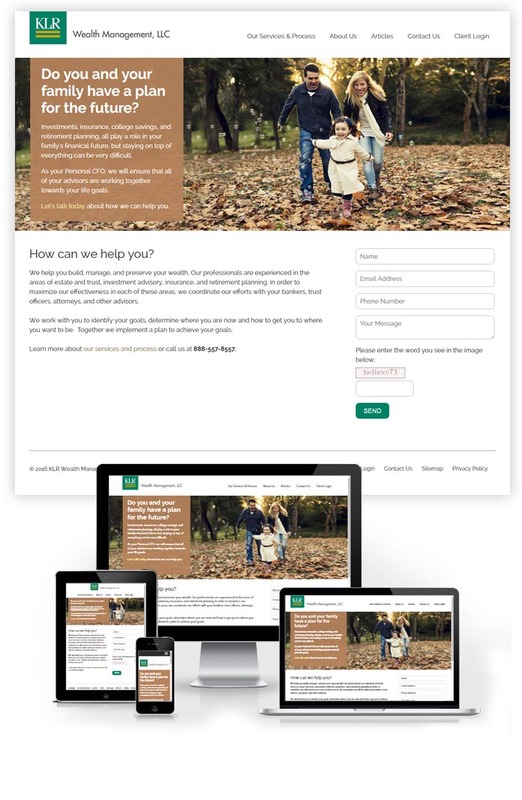 I had actually designed and developed the original site for KLR Wealth Management a few years ago. That had served the firm very well, but the need to move the site onto the ExpressionEngine CMS platform, as well as a desire to update the design of the site, drove us towards a redesign here. I handled all the initial design work for this site before handing off those designs to others at Envision Technology Advisors to develop and implement into the CMS. The project itself was an interesting one for me in the fact that it was for such a small site. So many of the projects I work on these days are for large sites with lots of content and functionality, so it was refreshing to work on a project that required less of my time in order to execute a solution that fit the client’s needs. You can see the latest version of KLR Wealth Management’s site at www.klrwealth.com.